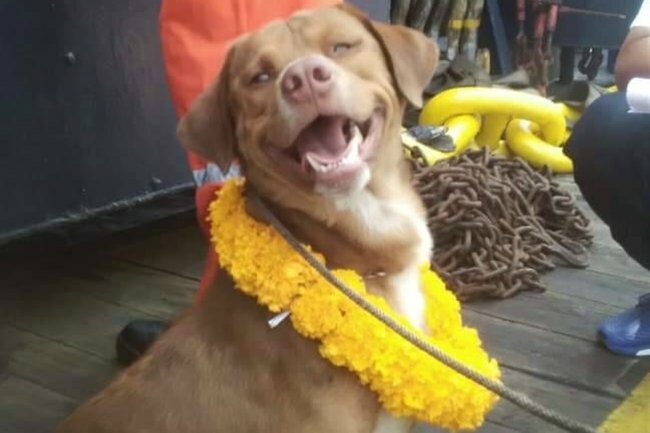 Dog rescue Thailand: A very good boy has been retrieved at an oil rig. GOOD BOY: A very brave doggo just got rescued at sea 220km from the shore. A brown aspin from Thailand has been retrieved by oil rig workers a whopping 220km from the Songkhla shore, after employees spotted the dog paddling in the ocean. Named Boonrod by his rescuers, a name that translates to survivor, the very brave doggo was reportedly dehydrated and hungry, and was cared for by the rig staff while waiting on assistance. So how exactly did a dog swim 220km? According to The Bangkok Post, Boonrod didn’t. Rescuers are saying it’s more likely he fell off a fishing trawler. Vitisak Payalaw, an employee of the oil rig, said the condition of Boonrod is improving. “Today (April 15), a vessel transporting the dog arrived onshore at around 10am. His overall condition has improved. He is getting stronger and can smile,” he wrote in a Facebook post. Since nobody has come forward to claim Boonrod as their own, he is being taken to an animal clinic in Songkhla for further care, and will be taken back to his home in Khon Kaen when he’s well. You are very brave, Boonrod.